Due to the cryogenic conditions in LNG storage tanks, LNG continuously evaporates in the form of boil-off gas (BOG). Minimising the loss of BOG while simultaneously avoiding flaring is not an easy process. BOG volume flow and mass flow in an LNG plant fluctuate depending on either the amount of BOG produced (mass flow fluctuation), or the fluctuation in the compressor inlet temperature. 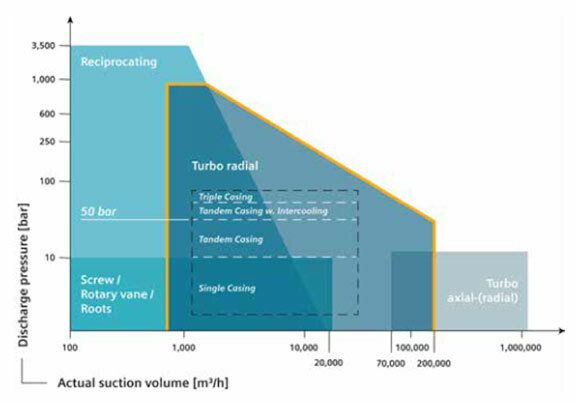 By understanding the different conditions required for an LNG plant in an early project phase, and knowing the final overall plant capacity target along with potential expansion phases, the best rotating equipment configuration can be determined when considering criteria for both CAPEX and OPEX. It is critically important to maintain the cryogenic temperatures required for BOG compression to meet the constant fuel gas pressure requirement in the fuel gas system. When BOG temperatures start to increase, the compression head starts to decrease. This effect can be overcome by cooling the inlet flow by using the evaporation heat of cryogenic LNG liquid. By spraying cryogenic LNG (approximately 5% of the LNG) into the inlet flow prior to the knock-out drum, these droplets then evaporate and cause the remaining BOG to cool back down to -150°C or colder (the initial compressor design temperature). BOG compressors today are optimised for a broad range of low to high BOG flows (occurring in the LNG plant from approximately 0.5 million tpy to 10 million tpy), and are capable of automatic start/stop operation from ambient, as well as cold conditions with no cool-down required. Thus, LNG quench is a viable option to reduce start-up time of a BOG compressor in warm stand-by. Due to the frequent BOG compressor start/stop required during direct online start-up in cryogenic conditions, the compressor runs in bypass until 100% speed is reached. This occurs when the inlet guide vanes (IGVs) increase the flow and pressure. LNG quenching serves as a useful alternative to flaring and can also be used to optimise equipment count and configuration. 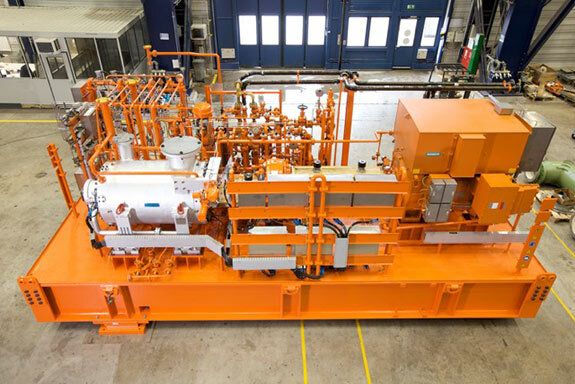 LNG plants require compressors that are capable of direct online start-up operation in order to avoid static cool-down and thus eliminate the need for gas flaring. These compressors will provide low temperature operation with intermittent stop/start service. Due to the nature of the BOG service and the required intermittent (start/stop) operation, the compressor is periodically exposed to very low suction temperatures (160°C), as well as to ambient and even high discharge temperatures. The casing design temperature window ranges from -170°C to 240°C. The application range of different compressor types. Depending on the different fuel gas pressure requirements ranging from 35 bar up to 55 bar, Figure 1 shows the compressor casing that is required for a specific duty, whether a single-casing BOG, tandem or even triple-casing BOG compressor. When BOG is used to supply fuel gas, the outlet pressure is always a required constant value. BOG mass flow coming out of the process undergoes large fluctuation regarding flow and suction temperature. Hence, when inlet flow temperature varies, more head is required. IGV control allows for the largest turndown, highest process flexibility, and broadest possible operating range with no flaring. The volume flow fluctuations are covered by variable IGVs providing maximum compressor turndown compared to all other available turbocompressor control options. The individual single compressor train performance maps and the overlapping performance maps of two units running in parallel will guarantee that all operating points will be covered without any (or with minimum) recycle flow. That is, if recycle is required or other warm operating conditions are required due to the suction temperature being adjusted by LNG quenching. Direct online start/stop capability with no required static precooling eliminates the need for flaring. Some future LNG plants are being planned with consideration for future expansions, which would cause more BOG flow. The key is to design BOG compressors and a concept solution capable of handling all expansion phases from the very beginning. This requires close collaboration between the engineering, procurement and construction (EPC) contractor and compressor manufacturer at an early front end engineering and design (FEED) stage. These meetings should involve the process engineering and rotating equipment experts. The biggest impact on overall project costs takes place in the early project stage. In most modern, large scale LNG plants, BOG and end flash gas (EFG) are used to fuel the mechanical drive gas turbines, which propel the large main refrigeration gas compressors and/or power generator sets. Using a target/design approach will help to gather all BOG compressor operating points where there is no or minimum flaring and/or no or minimum LNG quench. The goal of the approach is to find the best balance between the amount of LNG quench and added value. Authors: Christian Belting-Clar and Leonid Bleicher, Dresser-Rand business, part of Siemens Power & Gas Division, Germany.